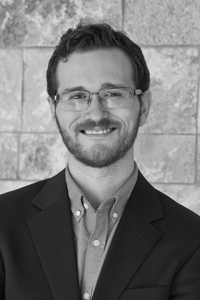 I am a researcher for a financial education company, which means I spend most of my time looking at data. When I graduated from the University of Illinois with a BA in English in 2014, that is not the job that I thought I would have. Instead, I had this idealistic image of supporting myself by writing full time. 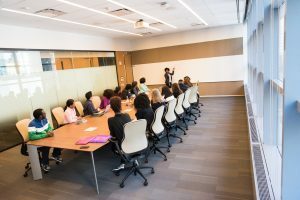 However, once I got out of school and began looking for a job, I quickly found out that finding a full-time salaried position in writing was difficult, to say the least. This was in large part due to the amount of experience that most writing jobs expect applicants to have before they will even consider them. I was not quite ready to give up on the idea of writing for a living, therefore I turned to freelancing. What I quickly found out from freelancing is that it is extremely hard to make ends meet. So, with a heavy heart, I decided to take a dive into the corporate world. My current job does not require a lot of writing. In fact, the only time I write for my job is when I am sending an email. At first, this didn’t bother me because I was preoccupied with getting adjusted to a new environment. Once I had settled in, I began to really miss the creative process that I had grown accustomed to in my time at the university. This lack of creativity in my life started to eat away me. So, like a good English major, I thought about it, and then I thought some more. Eventually, I came to two important realizations. Just because my job didn’t involve a lot of writing didn’t mean that I couldn’t still use the creative and analytical processes that I had cultivated in college. Once I had this realization, I began to look for ways to apply these processes to my job. I found was that just because I couldn’t use my written words to tell a story, didn’t mean that I couldn’t use my storytelling ability. Instead of using the written word, I simply had to use the data that I work with to craft a story. When I used my storytelling ability in this way, people responded much more positively to the information that I presented. Being more creative improved my job performance. I had been neglecting my creative side when I was not at work. So, I started writing again. I discovered that I enjoyed writing more because I no longer had to worry about the audience that I was writing for. I could write just to write. For me, it has been a great experience because there is no pressure. I also have complete creative freedom over my work because I don’t need to get anything published. I don’t have to worry about deadlines or writing something that can sell. Instead, I am free to create whatever I want to create. My advice to those who want a career using their writing skills? You can always find ways to apply your creative process to your job. And once you don’t have to worry about making money, you are free to write about anything that interests you. So, don’t limit yourself to just looking at jobs that involve a lot of writing because you feel like you won’t be able to use your creativity. Instead, go out there and see what all the world has to offer. “Grad school” can mean a lot of things. Your English or Creative Degree prepares you to succeed in a lot of different kinds of grad programs. 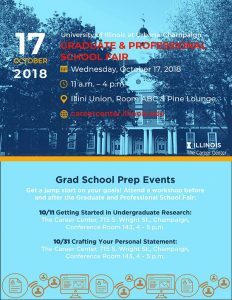 The upcoming University of Illinois Graduate and Professional School Fair on October 17 can help you explore some of your options. It’s in the Illini Union, from 11am to 4pm. Let’s start with the premise behind the question: that you will NEED a grad degree to get ahead. Voter registration has closed in Illinois, and early voting for the November midterm elections has begun. If you have not yet registered to vote in Illinois, you can do so, even though we are past the Oct. 9 deadline for mail-in voter registration. 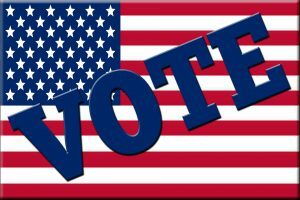 You can no longer register by moter-voter registration, but you can register online until October 21, and you CAN register in person at an early voting location and vote at the same time. Yes, you should vote. Your vote counts whether you cast it or not. Every politician, party, and PAC makes decisions based on what they think young people and college students will do on election day. The only way to make your vote say what you mean is to to fill out a ballot. The Illinois Sustainable Agriculture Research and Education (SARE) program at the University of Illinois is seeking a committed writing volunteer to tell a compelling story about a collaboration going on at Fowler Farm. SARE, the Champaign-Urbana Schools foundation, teachers at the local public schools, and Hendrick House are working together to help local students learn about sustainable agriculture, genetics, water conservation, landscape architecture, and so much more. We’re looking for a storyteller who can convey the scope of this grant-funded project, from its humble origins to its grand plans. This story will be widely shared by all of the parties involved. It will be distributed locally and on a state and national level to teachers, funders and those interested in agriculture education and local foods. You can read more about this project here, and you can read more about SARE and Ann Swanson, Head of Hendrick House Farming Operations, halfway down this page. If you are interested, please send a resume and a statement of interest to Mary Hosier, Project Manager at SARE (mhosier@illinois.edu) by 10/6/2018.